2017 was a significant and rewarding year for the Australian Romantic & Classical Orchestra. The support of numerous generous individual donors and philanthropic foundations together with a two-year grant from the Ministry of the Arts and a one-year grant from Creative Victoria enabled the orchestra to launch subscription series in both Melbourne Recital Centre and City Recital Hall in Sydney. 2017 also saw the presentation of a week-long youth orchestra workshop entitled Young Mannheim Symphonists. The ARCO Chamber Soloists toured regionally for the first time, presenting a concert in the Blue Mountains and also travelled to South Australia to perform in the Adelaide Hills. This new wave of Historically Informed Performers brought a revitalised spirit and energy to Beethoven and Mendelssohn’s masterpieces. The Australian Romantic & Classical Orchestra performed Beethoven’s Coriolan Overture, his playful Contredanses and the sublime Romance for violin featuring concertmaster Rachael Beesley, Wolf’s Italian Serenade for Strings and Mendelssohn’s thrilling ‘Italian’ Symphony, conducted by Berlin-based Guest Conductor Benjamin Bayl. The style and grandeur of the Romantic period came alive on the period instruments of the Australian Romantic & Classical Orchestra with the mesmerising mezzo soprano Fiona Campbell. The most extraordinarily spectacular overtures and arias from Rossini’s well known operas and Schubert’s most famous work, the ‘Unfinished’ Symphony was conducted stunningly by Berlin-based Guest Conductor Jakob Lehmann. The beautiful rich sounds and textures of the ARCO Chamber Soloists, with the star of the basset clarinet Nicole van Bruggen created thrilling and engaging performances delighting audiences and critics alike. Spohr's revolutionary new world of string playing was represented on gut strings and Mozart’s famous Clarinet Quintet, and the sublime Grande Sestetto Concertante - better known as the Sinfonia Concertante, revealed the extraordinary artistry and virtuosity of these world-class HIP musicians. Some of Australia’s brightest young musicians spent an amazing week of learning and playing in the company of Australia’s finest performers of Historically Informed Performance style (HIP). The Australian Romantic & Classical Orchestra conducted a four day workshop from 4-7 July with school students from all over Sydney, west to the Blue Mountains and Bathurst, south to Sutherland Shire and north beyond the northern beaches to Noosa in Queensland! Hosted by Santa Sabina College in Sydney’s inner west, more than 40 talented young musicians worked intensively to create a fresh and inspiring interpretation of Mozart’s Symphony no. 35, the ‘Haffner’. All brought their own modern instruments; however the tutors demonstrated on period instruments and shared their expertise and experience so that the students learned how to create a sound and style in keeping with the aesthetics of Mozart’s time. The sessions included full orchestral and sectional rehearsals, lecture/workshops and demonstrations – and lots of singing, gesturing, dancing and socializing with like-minded peers. Tutors were ARCO members - including some who flew in from Adelaide, Melbourne and the Sunshine Coast. The orchestra was directed by ARCO’s own concertmaster Rachael Beesley and tutors included Simone Slattery (violin), Simon Oswell (viola), Anthea Cottee (cello and double bass), Megan Lang and Nicole van Bruggen (woodwind), Matthew Manchester (brass and timpani) and Joanna Tondys (harpsichord). Two of the orchestra’s priorities for the 2017 Concert Season were developing audiences in both metropolitan and regional centres, and enriching the music education of young emerging artists. Audience numbers grew considerably in 2017 for all concerts. We saw extraordinary attendance of the young generation at the orchestra’s concerts with 17.9% of the 2017 concert audience consisting of students. In addition, 47 young musicians worked under the expert guidance of the Australian Romantic & Classical Orchestra musicians in Young Mannheim Symphonists in July. The increase in performance and education activities in 2017 required an expansion of the management team. 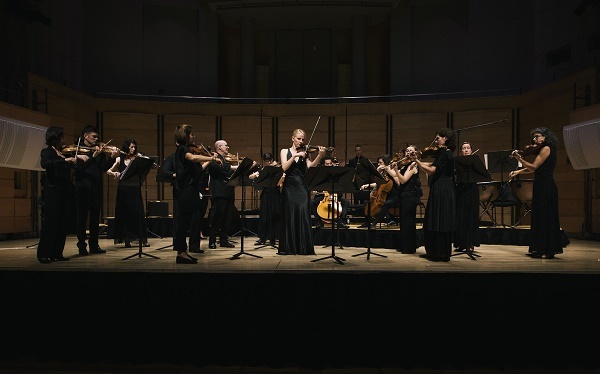 Since establishing the Australian Romantic & Classical Orchestra in 2013, the orchestra was managed by the trio of co-founders, Artistic Director Richard Gill AO, General Manager Nicole van Bruggen and Artistic Team Member and Concertmaster/Director Rachael Beesley. In 2017, a Company Manager was brought in to support the General Manager, and the role of Education Manager was created to coordinate the Young Mannheim Symphonists and work towards upcoming education programs. The orchestra employed a Production Manager, Designer and Publicist to work on a casual basis, ensuring the success of the orchestra’s activities.